Boy am I happy with this method! Can’t wait to retry all the wonderfully tasty breads I’ve tried from here and books that I’ve liked but just couldn’t get that spring going. This is a heavy cast iron DO and I’m small; but no problem at all getting this together. I did a trial set up to see how it would go and everything balanced so perfectly. When it was all pre-heated I think I lost less heat from the oven because it loaded (although a little crookedly) quicker than using the pot right side up. All worked like a charm. Final loaf and crumb shot, just shy of 3" tall. Gonna use this method again. Oven’s thermometer isn’t fixed yet so I could only get 450°. Wish I could devote to a constant stream of baking time right now, but I’ve got wallpaper to get up and tons of stuff to unpack yet. No more fretting on the steam methods in this old electric oven, for boules this is the trick in my equipment. Hurrah! All is very good and... I’m baking on! Really happy this method of using a hot DO worked out for you so well, and appreciate the credit given. 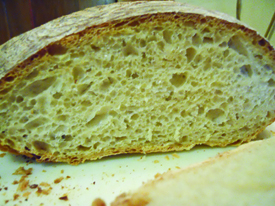 Your bread looks terrific, with a nice open crumb and good crust! Looks like the rave reviews for baking in a DO just keep coming in on an almost daily basis, no matter what method is used. It's a good idea place pot like this. My pot boule always bottom heating not enough. Thank you show this photo. I like to try place pot like this. 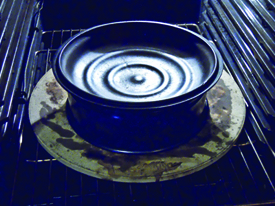 to get more heat on bottom, put a black baking sheet on the bottom of oven under pot. This draws heat to it. I found the round flat inside of a 2 part quiche pan ideal. Another trick is to place a black baking sheet upside down on bottom of oven. In this thread, I wonder how the bread would bake without the baking stone. Just rest the DO lid on the spring-form ring directly on the rack. Seems like one could save a lot of preheating time and more heat could get under the loaf. Thanks for your many good ideas for draw heat ! I will place something on bottom of oven. black baking sheet or tiles, which one is better? "In this thread, I wonder how the bread would bake without the baking stone. Just rest the DO lid on the spring-form ring directly on the rack. 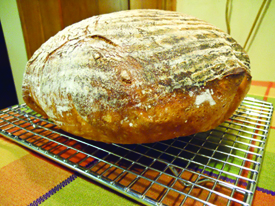 Seems like one could save a lot of preheating time and more heat could get under the loaf." Actually that's the way I've been doing it since using this method, but I'm considering using the stone so I have a bit of a buffer between the bottom of the lid and the bottom element. I've been getting some minor scorching, as the inside of the lid has raised semi-circle shaped drip/condensation bars lining it. The heat concentrates too much on these points so bottom heat can be a little uneven. What I'd like to do is take a round baking stone into a masonry shop and have him cut it to size for the inside diameter of the lid. I think this would give you the best of both worlds. between stone temp and iron temp? I find if pre-heated iron is brought up to stone temperatures, it burns the crust. If using the DO without the stone, I would lower the temperature (or move the rack up a notch) to avoid burning. 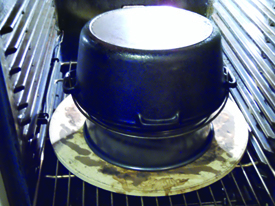 The spring form is doing two things... supporting the lid and because of the solid sides, trapping rising heat coming off the bottom of the oven. You may indeed be right ..however my theory is that with a stone below the lid it will provide a more evenly distributed heat rather than a flashy type of heat. All the loaves I've done so far in the DO have started at 500F then lowered to 450F once the dough has been loaded, with the dough on parchment during the first 1/2 of the bake. Moving the rack up isn't an option for me because of the height of the DO, since I want to remove the cover quickly without pulling the rack out. As I say it's a theory, but one I'll test on the next bake. Thanks for your input. Your bread looks amazing! May I ask what kind of bread? How long have you been baking? Your bread looks like it was from a "master baker". I am so...impressed! Mini, Franko--I use a generous amount of corn meal on the bottom of the DO. 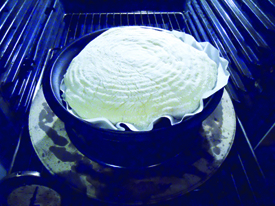 It acts like a buffer that prevents scorching the bottom of the crust. The corn meal does brown up and scorch eventually and I add more for the second bake when I'm doing 2 loaves. Here is the link to the last time I saw this advice submitted with visual proof. She was using grits which might even be better or white corn meal. You’re stone comment made me laugh. I’m so used to that thing I didn’t even consider the points you raise. I was thinking it would give stability to the springform ring but it probably doesn’t. Although in the past I’ve gotten loaves that are too dark on the bottom for my liking, and this one was nicely golden all around, so I’m not possitive it helped that purpose but I seemed to get nice evn heat lid to top. You’ve given me a good suggestion though, to try it without the stone some time. I’ve been baking on and off for many years, but more seriously in the last 3. This loaf is the basic Jim Lahey No-Knead bread. Used that because of time pressures and I wanted very much to try this Dutch oven method. It seems very promising for any lean bread formula and I intend to use it often in the future. Whatever the method we shall....Bake on! LOL What to do with a "Baker's Cave"